Will Imagine Happy Cooking / Imagine Master Chef whip you up into a frenzy, or leave you simmering for more? Find out in our review. If someone asked me to "imagine happy cooking" then I must confess that my resulting daydream would probably involve someone cooking a meal for me. Fortunately, that's not the case for everyone, and it's certainly not the case for Lisa, the star of Imagine Happy Cooking (Imagine Master Chef in the US) on the Nintendo DS. Lisa's dream is to learn how to cook. Specifically, she wants to treat her absent father (who we are lead to believe is on business in Europe right from spring to winter) to a fantastic slap-up feast when he finally returns home. (Assuming that by then she hasn't become depressed and fallen in with the wrong crowd at school and started wearing all black and listening to Marilyn Manson). Unfortunately for her, her cooking skills just about stretch to beans on toast at the start of the game. However, help is quick to arrive when Lisa wishes on a shooting star and a mysterious moon spirit called Virluna quickly sends one of her servants to help out. This particular magic spirit possesses Lisa's favourite stuffed bunny, Hopper (and later brings her other toys to life too). Hopper quickly arranges for TV's top chef Rachel to teach Lisa how to slice, dice, simmer and serve the yummiest looking food on the planet. Once you've read through the first part of the story (or, as many less patient youngsters will probably do, skipped through it) it's time to head to the kitchen for your first lesson. Firstly, you gather your ingredients from the fridge, by dragging and dropping them, then you are ready to cook. Cooking is done entirely with the stylus, there are 8 basic cooking games to play as you prepare a dish. The tasks range from cutting, which requires you to tap the knife with your stylus, to battering, which involves dipping pork or other meat into flour, eggs and breadcrumbs using the stylus to dip and shake off the excess. 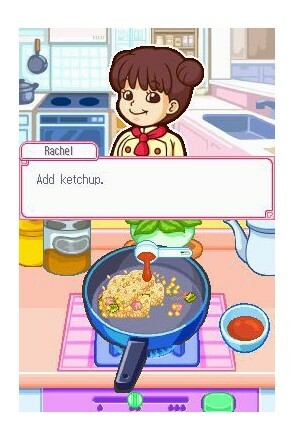 Although the game refers to the cooking tasks as "cooking games" and they can be practised at any time from the games main menu, calling them games is a bit of a stretch. You see, each of these tasks is so incredibly easy that even very young children will not find them challenging. Take cutting, for example, you simply tap the stylus on the screen anywhere to cut the food, with no time limit or precision needed at all, it is simply impossible to make a mistake. Even the more complicated tasks like frying are simply a matter of clicking the stove off as soon as Rachel tells you to do so. After you complete all the tasks, you get to serve up your food. This is probably the most fun part of Imagine Happy Cooking / Imagine Master Chef. You get to choose an assortment of tableware and cutlery and garnish your food however you see fit. If you go too wild however, expect to lose points when Rachel (or whoever is eating your food) comes to give you your final grade. Even so, we are sure budding young chefs will be delighted with this part of the game.